This chapter provides an introduction to Part I of the book, which focuses on examining the characteristics of teacher education programs that participated in the Teacher Education and Development Study in Mathematics (TEDS-M), a cross-national study of teacher education programs that prepare future primary and secondary mathematics teachers. The study collected institutional data from 751 programs in 17 countries. In this introduction to Part I, we provide an overview of the characteristics of the teacher education programs studied and of the teacher educators within them, the methods of TEDS-M data collection, and the challenges encountered when collecting program-level data. The overview is followed by an introduction to the chapters in Part I, which explore different aspects of the participating programs. The first chapter looks at the types of strategies used in the pursuit of program quality and their relationship with programs’ outcomes. The following chapter explores the characteristics of the curriculum of mathematics teacher education in programs preparing primary and secondary teachers in the U.S. The penultimate chapter looks at the extent to which teacher education programs are designed to educate diverse populations, and what opportunities are provided to future teachers to learn how to effectively teach diverse groups of students. The last chapter of Part I investigates the views of teacher educators about mathematics teaching and how these are reflected in the views of their future teachers. The text in this introduction contains shortened and slightly edited versions of text that has appeared in the following publications: Tatto, M. T., Schwille, J., Senk, S. L., Ingvarson, L., Rowley, G., Peck, R., Bankov, K., Rodriguez, M., & Reckase, M. (2012). Policy, practice, and readiness to teach primary and secondary mathematics in 17 countries. Findings from the IEA Teacher Education and Development Study in Mathematics (TEDS-M). Amsterdam, the Netherlands: International Association for the Evaluation of Student Achievement. Brese, F., & Tatto, M. T. (Eds.) (2012). User guide for the TEDS-M international database. Amsterdam, the Netherlands: International Association for the Evaluation of Educational Achievement (IEA). Tatto, M. T. (2013). 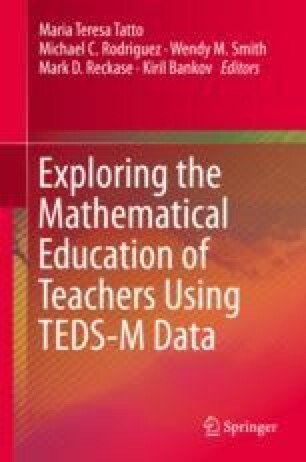 The Teacher Education and Development Study in Mathematics (TEDS-M). Policy, practice, and readiness to teach primary and secondary mathematics in 17 countries: technical report. Amsterdam: International Association for the Evaluation of Student Achievement. Text cited directly or indirectly from those sources will not be made recognizable. An extensive report on the descriptive findings on the characteristics of teacher education programs in the study can be found in Tatto et al., (2012). We summarize the key findings here and reproduce some figures and tables to orient the reader; the chapters in Part I however are original contributions written exclusively for this book.